We are a different type of Valuation Company. All of our generic market solutions are currently free, covering 60 Residential to 75 Office (US/Canada) Markets. Our web solutions are either mobile-friendly requiring no additional apps or are seamlessly integrated with mobile apps. Our wide-ranging AVM solutions offer an excellent value proposition. Homequant, our flagship comparable sales solution, has all the advanced features professionals need to work-up individual subjects, including an on-screen adjustment matrix with time and distance, flexible valuation dates, variable scoring and ranking, a spatial interface and, a professional comps grid with full value analysis. 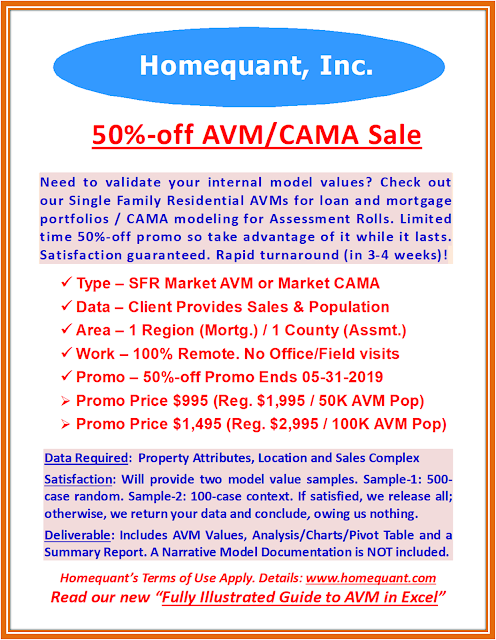 Try our 30-Second HomeValu to value a home in 30 seconds, TownAnalyst to analyze sales and assessment, identifying any inequity on the roll and, LocValu to market-adjust generic cost tables, baseline AVMs and more. Use our proprietary 60-Second solutions (perfect as first look valuation, ideal for internal QC or to revalue your entire portfolio promptly): (a) SkylineValue.com for Office valuation, (b) Homeyada.com for home valuation and (c) Condoyada.com for condo valuation. These solutions cover over 75 major markets and are mobile-friendly, thus requiring no additional iOS or Android apps. We offer a host of cost-effective AVM solutions – from Market to Income to Benchmark to Grievance to Foreclosure - with 100% satisfaction guarantees. Visit our websites for current promotions and guarantees. Our other business and technology services include research services, sales ratio studies, pay-per-call AVM support, pivot tables, static pools, mobile apps, outsourcing and ad inventory rentals. Note: In order to retain/attract upscale retail tenants downstairs and triple-A office tenants upstairs, proper upkeep and modernization are critical for Class-A office properties. Note: Class-B and Class-C properties rarely attract upscale retail and triple-A office tenants. Note: While we currently cover 75 major office markets in the US and Canada, our custom plan will have no such market restrictions; your market could be anywhere in the world as you will collect and manage your own data. Use SkylineValue.com to Value a Trophy Office Property in 60 Seconds. Free!! The above graphic represents the sample valuation of One World Trade Center, a trophy office property in Downtown NYC. SkylineValue.com produced this sample valuation in less than 60 seconds. Try out your own subject office property. It's totally FREE and no login/registration of any sort is required. We cover 75 Major Office Markets in the US and Canada. ORLANDO, Fla. - Oct. 15, 2016 - PRLog -- Sid Som, owner and publisher of prominent data analytics and info sites like Homequant, TownAnalyst and LocValu, is pleased to announce the launch of ChefQuant Solutions, a data analytics and modeling service for restaurant owners, managers and executive chefs. Unlike trade organizations that focus on macro industry trends and generic industry solutions, ChefQuant Solutions will offer customized service and solutions to individual restaurants, effectively mining and modeling their sales and survey data. Sid' new Book 'ChefQuant – A Practical Guide to Data Analysis and Modeling for Restaurant Owners, Managers and Executive Chefs' spearheads the launch. While the vast majority of independent and non-chain restaurants have access to their customer data, they do not necessarily possess sound know-how to explore and mine their own data reservoir. Sid contends that each restaurant has its own unique micro market, often significantly bucking its (macro) industry trends and nuances. A restaurant's data reservoir is therefore its own internal goldmine with hidden answers and solutions waiting to be harnessed for their success and profitability. all industry solutions often require costly re-engineering to be, at best, somewhat productive for most members. Instead, if they are provided some hand-holding in understanding and modeling their own data, they will perhaps promptly learn to address their own shortcomings and remain on a profitable path. The reason Sid published the Book ahead of launching the consulting service is to demonstrate as to how his proposed solutions could be of tremendous help for all restaurant owners – successful or not-so-successful. Even those who are contemplating opening new restaurants or adding new locations can benefit immensely from his services. Since ChefQuant solutions are based on a restaurant's own data, rather than borrowed generic data from the competition or the industry as a whole, they are totally custom tailored, addressing their own unique issues and challenges, hence incredibly result-oriented. Depending on the individual needs, ChefQuant Solutions will provide solutions ranging from customer survey analysis to demographic analysis for new locations to identifying deficiencies in existing menus to advanced sales and seasonality analysis to sales forecasting to internal performance and service metrics, to name just a few possibilities. Needless to say, ChefQuant uses sound statistical, econometric and operations research techniques in mining and modeling all data. In a recent conversation Sid mentioned, "The independent restaurant market is one of the most competitive markets out there. One of the reasons many succumb to the competition is that they do not attach much importance to data analysis and modeling, which in most cases hold the key to their success or failure. Granted, restaurant owners, professional managers and chefs are not expected to be trained quantitative technicians, which obviously created a dire need for external professionals to step in and work with the industry to develop custom solutions. I urge all restaurant owners, managers and chefs to read my new Book and decide for themselves what we have to offer. Moreover, our solutions carry 100% satisfaction guarantee, so what do you have to lose? Bring your data to us and we will show you the path to continued success and profitability." I just finished reading the book and I just wanted to let you know that I really enjoyed it. I love the approach you took with it. You were able to give all that amazing info and analysis but by telling the story you did it in a way that is easy reading and very compelling. There’s a lot of valuable info packed in here that anyone who has an interest in restaurants needs to be aware of. I was hoping for a different ending but I’ll get over it. Well done Sid and I hope ChefQuant takes off! This Promo has ended. Please check August, 2016 Promo.